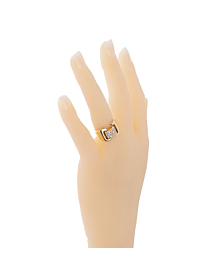 This vintage diamond yellow gold cocktail ring from Hermes makes a bold and elegant statement. 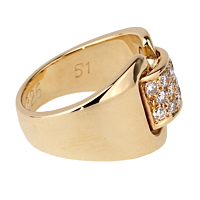 Crafted in 18kt yellow gold, the diamond yellow gold cocktail ring's wide bands connect with a square motif adorned with the finest Hermes round brilliant cut diamonds (.38cts) in 18k yellow gold. When it comes to Hermes jewelry, there is no question that you will be indulging in the highest quality fine or fashion jewelry items around. Hermes has managed to effortlessly incorporate modern trends within the classic Hermes quality and style that the brand is known for. 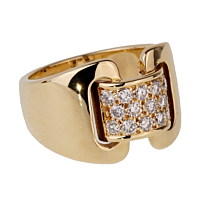 Hermes gold jewelry is especially renowned for its boldness and radiant finishes. When pursuing fine Hermes jewelry you will be undoubtedly finding the perfect piece to elevate your entire ensemble to the next level. The timelessness of Hermes pieces is this brand's hallmark and the reason why it has been synonymous with sophistication for decades.